Free Angel Card Reading With The Ask Angels Oracle Card Deck! Free Angel Card Reading with the Ask Angels Oracle Cards! Tune into the guidance and messages of your angels right here and now with a free Angel Card Reading using the online version of the Ask Angels Oracle Cards. If you're new to connecting with your guides and angels, or you're new to accessing your intuition, you may want to start by reading our short guide on How to Do An Angel Card Reading in 7 Simple Steps. Before you start your angel card reading, call upon your angels to surround and connect with you, think of the question you have for the angels and choose a card… Notice the thoughts, or feelings you have in response to the angel card you draw, and read the description to connect with the guidance of your angels available to you now. Want to learn to give accurate Intuitive Angel Card Readings? Click Here For The Free Video That Teaches How! Click On A Card Below to Start Your Reading Now! You are able to step back in this way to connect with an inner a state of peace, calm, and stillness despite whatever turbulence, excitement, or chaos flows around you in the outside world. By practicing quieting your mind, opening your heart, and being at one with the moment, you will be able to do this in your day to day life. You will be able to call upon this valuable skill in times where waters are turbulent, and in times where the atmosphere on earth is chaotic. An inner well of peace and love can be found within you. Connect with Archangel Michael for Yourself! It is your inner capacity to evolve and expand that brings blessings in the outside word to the forefront... Let yourself feel the truth of who you are. Let yourself remember. You are a conscious being, you are a light being, and so as you breathe in the light that is all around you now, let this simple truth make more sense. You are not separate from the light, or from the Divine, you are one with the Divine and one with everything. At this time you may begin to imagine or see the Divine light which is present all around you, consciously breathe it in. Feel the light flowing throughout your being, and now as you breathe out, share freely of your inner light, love, blessings and compassion with all that is. This simple process is a tool in your tool belt that will be available to you fully as you practice and claim the blessings of the light for yourself. We angels offer you many blessings of light and love with open arms, however, you dearest one, must be the one to take them and to integrate them in your life. Change and growth do not happen without you or outside of you. It is your inner capacity to evolve and expand that brings blessings in the outside world to the forefront. It is your inner state of being that is mirrored in outside reality. Find the place of peace, love and calm within you, through simply breathing in light in this way. Shine your inner light and this inner beauty cannot help but manifest outward in your life as well. A beautiful clarity is beginning for you now. Surrender and allow upliftment to take place in your life. Let this wave of light and clarity broadcast from the Divine enter into your experience and renew you in every way. Embrace the change happening within and around you and notice your thought processes becoming more clear and exact, your emotions Divinely balanced and the feeling of joy love and contentment fully experienced in your life. Your physical body is increasing in vibration and, as this happens, your old hurts, trauma and pain are released from your cells. Let go... Release and trust. This new level of clarity you are stepping into brings with it a deeper understanding of your purpose on Earth. Look forward to living with more joy and contentment in your life, and act on little nudges as you are inspired to live with more clarity now. It\'s time to move forward with joy and love. When you are in joy, laughing, or having fun you are essentially energizing these qualities and magnetizing more positive blessings into your life. Joy has the power to release obstacles and bring you into alignment with what you love, want, and need. To align with your divine path and life\'s purpose follow the feeling of joy. Do what makes you feel inspired, happy, and alive. Take a moment now to consciously breathe, relax and release any accumulated density you have absorbed into the light, allowing joy and love to take its place. Archangel Ariel is quite active now, giving you the courage and strength required to stand in your power, reclaim your full connection with the Divine, and experience a truly joyful, loving and magical life. Make the time in your schedule each day to simply play and enjoy your life. The choices you make today will set the stage for your next steps. Keep choosing joy and love in the present moment to ensure a positive future. Your guides and angels are with you and can help you with your current situation. Although you may sometimes feel lonely, you\'re never alone in navigating your path through life on Earth. Your guardian angels and spirit guides are always with you, and they are ready and willing to help. Consciously invite these powerful spiritual beings into your meditation space and they will help you to further strengthen your connection. This card is a sign that yes, you have guides and angels who are with you, and who can definitely help you with your current situation, but they will not interfere in your life without your permission. Remember to ask for angelic assistance. Think or say \"I now call upon my highest, best, most loving guides and angels to come in and surround me. Assist me in raising my vibration so that I may clearly see, hear, sense and know your love, guidance and assistance in my life. Help me with my current situation, help me to align with my highest and greatest good, and help me to know that I am safe, loved, and protected. Thank you.\"
The thoughts, beliefs and memories you have, including your job, your bank account balance, the relationships you are in, who you are in terms of your personality: this is all your past. All that you have done is actually past, so let it go. Right now begins a new day and a new cycle within your life experience. In your new beginning you are encouraged to use your mind, connected with your heart, to align yourself with the Divine will and the true life purpose of your higher self. Now is the time for you to step into authentically living as your higher self, and anchoring your full spiritual light into the physical. Do not worry if you cannot see the entire path before you, just take your next step with love and gratitude and the next step will appear. Your soul desires to be of service to others. This card brings validation that you have been called into service as a healer, teacher, or lightworker. Start wherever you are now, asking the question \"How may I serve myself and others with love?\" Serving others with love and gratitude will really pay off for you and can bring about significant and lasting change in the world. Love truly holds the power to carry you forward towards new positive experiences to be thankful for. Celebrate the goodness that is to come in the future by appreciating even the small things you have to be thankful for you in your life right now. Celebrate the accomplishments and successes you see others having as well. Serve others with love and gratitude, then open your arms to receive in return with love and gratitude. Forgiveness of self and others is an important next step on your path of spiritual growth and increasing awareness. Opening your heart and healing with love and forgiveness is key to entering into the next level of your life\'s experience. Imagine calling in Archangel Zadkiel and the power of the violet flame to transmute your past or current challenges into love. Release any unforgiveness held towards yourself and towards others so that you can remember the truth of who you are. Pain that comes up for you, challenging memories and feelings tied to past situations are coming up for one reason and with a distinct and clear message, release me! Open your heart, breathe, and simply let go to release what has been into the light. Forgive and let go as past densities and challenges are transmuted into the light of the violet flame. Forgiveness will assist you in releasing heavy emotions like fear and anger, which block your flow of energy and cut you off from the goodness of Divine love which is present throughout all of life for you to tune into. Focus on your breathing, center your energy and allow a new level of love, joy, and light to enter into your life. Allow what is, and what will be, to become infused with Divine love. Forgiving is not always easy, but it will enable you to lift your vibration and to remember and experience the full light of the spiritual being that you are. Forgiveness now will pave the way for many blessings to come. Radiate joy to nourish your soul and to infuse all of reality with the blessings joy brings. This card is a reminder to be joyful throughout your daily life. Joy is not outside of you, it is a level of awareness, and an attitude that you can choose to tune into. Call upon Archangel Ramaela to help you bring more fun and joy into your life. Through joy you can catch a glimpse of the full radiant light of your soul. To be in joy will invigorate you and inspire success and creativity. Be aware of activities which inspire joy in your life and do these more often. Schedule a play date with yourself, or take a field trip to somewhere you will enjoy and that will make your heart sing. Make time in your busy schedule to simply play, watch a funny movie, explore somewhere new, spend time in nature, or find a reason to laugh with a friend. If you\'re struggling to find your joy, volunteer some of your time in service to those who are less fortunate. Serving others is a quick route to increasing your own level of joy as well. You are one with all of life. Get outside and connect with the natural world around you and start tuning into the beauty and oneness which is all around you. By simply being present in, and surrounded by nature, you\'re able to effortlessly receive healing and rejuvenating benefits from the natural world. Within your every interaction with nature you are blessed and uplifted. Spending time outside connecting with the nature will help to bring you a fresh perspective, and align you with a new positive outlook towards your life. Nature holds magical healing power for your body, mind, and spirit. Nature has the power to ground and balance your energy, and has much wisdom to share. Connect with the magical healing power of nature to transcend the experience of separation and to fully experience your oneness with all. Or just get outside to boost your mood, improve your health, and increase your connection with the angelic realm. Your chakras, or energetic centers are essential in accessing and translating the higher realms of spirit into physical form. Through your open and activated chakras, you are able to lift in vibration to connect with your Guardian Angel, Spirit Guides of the Light, Archangels, Ascended Masters, and directly with the Divine. When the chakras become blocked through negativity or disuse, not only are you blocked from the realms of spirit... You are likely to experience symptoms in your physical body as a result of blocked or out of balance chakras as well. A simple practice to cleanse and activate your chakras is this. Quiet your mind, and begin to feel your energy center, and then ground to the earth. Feel your oneness with earth, and with All That Is. Now imagine divine white light flowing up from the core of the earth. Allow this light to enter in through the bottom of your feet. Allow the light to flow up, opening, balancing and activating your root chakra, sacral, solar plexus, heart, throat, third eye, and crown chakra which are all united in white light. Now continue to lift up and into the light, into direct presence with Source and All That Is. This fully opens and activating your chakras for the highest and greatest good. Clear and shield your energy! As you advance spiritually, you may become more sensitive to the dense and negative vibrations of reality alongside the higher dimensions of love. This card is a prompting to regularly clear and elevate your energetic space. Right now, take a relaxing breath, and imagine that you are being surrounded in an orb of white light. Your guardian angel and guides of the light flow light and blessings of healing and frequency your way now. Breathe naturally, as the white light clears and releases dense energy, toxic patterns of thought, filters of negativity, cords, hooks, limiting beliefs, and all which no longer serves you into the light. Imagine the orb of white light shining all around you. Feel the peace and love, and know that you can call this white light orb in to cleanse, uplift, and protect you at any time. White light will protect you on all levels, while also cleansing and uplifting your personal vibration each time you call upon it. The specific words to call upon white light do not really matter, for when your intention is clear, the divine gift of white light will appear. Practice calling upon the orb of white light, and this valuable spiritual tool will be available for you at all times to shield you from negativity and to assist you in lifting into a new level of vibrant well-being. Enter into the void. Relax your mind, breathe, and open your heart to enter into the still, calm, silent place of infinite possibility within. It is from within that you are able to recognize your oneness with all. Quiet your mind, open your heart and drop in. The void, this place of still, silent calm within you is accessible in every moment. The void is simply a breath away and contains infinite possibility. As you connect with the void, you are able to connect with your full spiritual light and power. As you do this, your vibration increases, and as your vibration increases, the infinite blessings of Divine possibility becomes available to you. The calm space of void found within you offers healing, offers clarity, and offers an uplifted state of being. As you increase your vibration through positive emotions, through love, and through connecting with the stillness of the void within, new possibilities, and new pathways for positive experiences in your life are divinely inspired. Self-love is a prerequisite for receiving love from others and from the Universe. While treating others with love and compassion comes naturally to you, remember to treat yourself with the same respect and kindness. Immense self-love is not selfish, nor is it vain, self-love allows you to overflow love to others, and contribute far more than you could without the strong foundation self-love brings. There\'s no need for drastic changes or alterations to your life at this time, just take a few more steps every day to nurture yourself. Give yourself permission to relax, play, and engage in activities strictly for fun, relaxation, enjoyment and to nurture yourself. Practice monitoring your thoughts and release harsh judgments and negative self-talk with positive affirmations which will help you to feel good about who you are. You are a beautiful and unique seed of the Divine who is worthy of love from the entire universe and from yourself! Your physical body has the innate ability to heal itself... But negative thinking, toxic emotions and external density can block the natural healing flow of your energy body. Archangel Raphael is on hand to assist you in peeling back the layers of density present to allow your vibrant, radiant, natural state of well-being to shine through. To invoke the healing energy of Archangel Raphael, simply think or say \"Archangel Raphael please surround me in your emerald green healing light. Clear my physical, mental, emotional, and spiritual being from negativity in all its forms. Release any dense or toxic energy into the light, and help me to stay grounded, centered, and present in the energy of love. Help me to start making healthy choices in the present moment to restore my natural, radiant state of well-being.\"
Know that when you invoke the healing light of Archangel Raphael, he will often show you how you can heal yourself. Be sure to act upon any intuitive guidance you receive. When you consciously relax, you are rejuvenated. Give yourself permission to relax and to simply be. You\'re always connected to the infinite wisdom, healing and inspiration of the Divine... But in the busyness and chaos of life, this connection can become blocked by tension, or it may simply go unnoticed as physical distractions occupy your focus. When you consciously take the time to relax, your body, mind, and spirit all receive rejuvenation and healing. When your mind is relaxed and still, the guidance of your angels and the inner knowingness of your soul can be felt and understood. Life can be chaotic, but by relaxing and breathing, your burdens will be eased. When you are in a relaxed and present state of being, the Divine beauty of your life and path are able to shine through. Right now, take a moment to simply be, relax, and breathe. Focus upon your breath, and let go of thoughts. Ask yourself: \"What would be relaxing and rejuvenating for me?\" Whatever the answer to this question is for you, do it! Go for a walk in nature, prepare a meal, take a nap, meditate, work in the garden, go swimming, breathe deeply, or get a massage. Do whatever it takes for you to relax and unplug, because... When you\'re relaxed and present, you\'re open to the divine guidance of the universe. You also open to your own intuition, and to the guidance from your team of guides and angels. When you want more abundance in your life... When you want more, shift your thinking not to how can something outside of you align this into your being, but how can you create more, give more and offer more value to the world, to humanity and to the collective. For in offering value and creating something that benefits all, you are rewarded with all the abundance you would ever want and seek. Creating is your birthright as a spiritual being in human form. Creating is essential to align with the fulfillment you seek in this life, for creating is the path of growth. Creation requires you to put yourself out there, to push beyond your ego, which says you cannot, to follow the promptings of your heart and your intuition, to manifest your creative potential and your ideas into being. Creating and being creative speaks not at all and not only to painting or being an artist, or expressing in this way. It is fine if you do these things, if these stir the passions of your heart and this is what inspires you, but there is much more to the creation process. There is much more to being creative. Being a creator speaks to the creative process present within all avenues of life, all colors and shades and facets of expression. Through present moment awareness you are able to understand and experience that which brings you passion and fulfillment. Your joy and your love and your passion, act as a guidance system in this life, aligning you with areas to create within. Areas which will serve all, which will reward you, which will empower others, which will hold value for the present time, for the collective consciousness, for humanity, for all beings. As you create value, you are compensated justly. Clearing any blockages, allowing the divine light to flow up, now fueling the flame of your heart, the energy of earth and of divine. Open your heart and allow the light to continue to flow up through your throat, your third eye, your crown, and opening and expanding the energy of your light body. Your aura is being rejuvenated, replenished, as the light of earth flows up through you and up out your crown at the top of your head. Go up with the light now, way up, connecting with the infinite supply of divine light, of source, up above the angelic realm, above the realms of spirit, of ancestors, of ascended masters, going up consciously, imagining you are going up, feeling yourself traveling up in vibration, linking directly with the divine, with all that is. Being here raises your vibration, replenishes your energy, heals your physical, mental, emotional, and spiritual being, and allows access to knowledge, wisdom, and truth. Breathe and feel the blessings of the divine bestowed upon you now, the blessings of all that is uniting with you in this present moment, and now imagine the light of the divine pouring down, flowing down like a waterfall of light upon you, cleansing away any tension, stress, negativity, doubt, and assisting you in now anchoring your energy once more to the core of the earth. Ground, becoming present, centered, and aware of your connection to earth, to the divine, and to all that is. When you are grounded your mind is calm and alert. You are open and aware, able to perceive the magic around you and within you, able to choose how to respond consciously. Able to respond with love, and ready to take your next step on your authentic path of becoming more and more in every moment aligned with your highest and greatest good, so that you may serve and love, make a difference, live inspired, awake, in line with your divine path and purpose. Doors are opening before you now inviting you to step forward, into living authentically true, authentically you, inspired and alive. Be not afraid to step into the unknown, for within the realm of what is unknown much will be revealed to you. When you listen with your heart you will be led in the direction of your ultimate becoming. In this you are able to learn to live by your own truth. To live life your own way according to divine design, according to your true soul\'s calling, with awareness and presence and a willingness to question, to seek the truth, and to ask yourself, \"Why?\". Like a detective you are able to uncover all that you authentically are. Not another, not anyone else, but your true soul\'s purpose, passion, and desired expression here in the physical. And so let yourself solve the mystery of who you really are, embarking upon new pathways, exploring new potential possibilities, and along this road question why you are drawn to this path, why you are doing this, why you want this? Turn the page on what others think you should be and want you to be, by asking yourself, \"Is this my heart\'s true calling?\" Respond to your heart\'s call to live inspired, to live love, to live the truth, the fullness, the richness, the vibrant beauty of who you really are: spiritual being in physical form. Solve the mystery of what you really want, and who you really are, learning how your soul is able to manifest most vibrantly in this realm. Step into living filled with love, aligned with purpose and meaning, creating for your highest good and for the well being of all. Tune into your intuitive power. Tune into your ability to perceive, know, and experience with all your senses beyond the realm of the physical, and into the realm of the divine, of angels, and of spirit. Know that all the magic of the universe, of the realms of spirit, and of the divine are available to you. Simply go within and open to experience this divine love, light, and magic that exists beyond the veil of illusion within this present time. Imagine Divine Light all around you and breathe it in. As you exhale, feel yourself relaxing deeply, and entering fully into this present space and time, becoming aware. Focus on your breath, and as you take in another deep breath through your nose now, breathe into your lower abdomen, filling yourself up with light of the Divine. And now as you exhale, tune into your energetic field, which is infused with the divine light all around you. Imagine your energy as a sort of hourglass shape, receiving with open arms, the light of the divine, intuitive guidance, infinite wisdom, well-being, healing, and love from above. Imagine the middle of your hourglass energetic form as strong, stable, and present. Your core of energy filled with light, helping you to increase your awareness, and to be fully present at this time. And visualize the bottom branching out again. Light flowing down to the core of earth where you are able to feel your oneness with the Divine through Earth, and with All That Is. Look for magic, look for miracles, look for blessings, and they will appear in increased frequency. All of your unique gifts and abilities to perceive in the realms of spirit will be made known. Beloved one, I am Archangel Raziel and you are so dearly loved. With a final surge of divine light, you are blessed, lifted, and attuned to the intuitive power and gifts which are your birthright, for the magic of the divine is meant to be known, enjoyed, and experienced in your own life. Your habits are being transformed. Experiencing the higher vibrations of love and light is empowering you to make healthier choices, to create new positive habits, and motivating you to take action in the direction of infusing your life with positivity. Indeed your every thought in every moment, your every action, your every habit, is creating. Every choice, and every action creates a reaction. This you know, this is a truth of the universe, and so we say to you now in this moment, empower your life through positive thoughts and actions and habits, for these will align you with moving forward in the direction of your soul becoming. Moving in the direction of full awakening, through empowering your habits, through bringing about positive changes into your life, you begin to move in the direction of growth and increased love, health, vibrancy and vitality. For the actions you take create, and so healthy habits, buying healthy foods, growing foods through connecting with Earth, meditating, quieting the chatter of your mind, uniting with your full light and spirit, lifting in unconditional love into the vibration of peace and harmony and hope and well-being serves. This is no small deed. When you heal, grow, and expand consciously, spiritually, and mentally, the power you tune into immediately flows throughout and influences All. And so create simple, positive changes through your habits, through your thoughts, through making a choice which will bring more health, vibrant well-being, love, and joy into your life. By default, you are infusing the entire paradigm, the collective consciousness, with these positive blessings for all. Let this message ring in your ears, in your heart, and in your mind. You hold the key and the power and the light to transform this realm. Your Team of Guides and Angels: You deserve to live in a peaceful and protective space, and your angels are present here and now to help you complete an energy clearing! Think or say: \"I now call upon Divine white light, and ask that my highest, best, most living possible guides and angels please come in and connect with me now. Enter into my home and release into the light any and all negativity, density, stuck or stagnant energy which is present. Please cleanse and uplift the energy of this space and help me to create a loving, happy and supportive environment here for myself and my loved ones. Please release negativity present in my home in any form, into the light of the Divine, for the highest and greatest good.\"
\"Archangel Uriel, please assist in dissolving into the light any remaining negative energies or limiting patterns of thought which are tied to this space. Archangel Gabriel, please release any remnants of arguments, misunderstandings, doubts or fears. Archangel Michael, please cut any and all draining cords, and release them into the light, along with any negative emotions, or memories tied to past, present, or future events that may still be connected to this space. Archangel Raphael, please release into the light any lingering hurt, pain or density stored within this space. Thank you...\"
\"I now ask that my guides and angels of the light fill my home with unconditional love, joy, positive energy and compassion. Surround my home with your angelic energy of protection, support, and care. Fill this space with healing, uplifting energy, and with the light of the Divine. Bless my home and all who occupy this space, helping to create a positive, harmonious atmosphere, for the highest and greatest good according to Divine will... And so it is.\"
Breathe and begin to imagine that you are being transported back in time now to your childhood. Tuning into the essence of your inner child, the vibrant light, the joyful, playful, radiant love, and perhaps the fear, sadness, or feelings of being unloved. Tune into this divine inner child now. Breathe and just be aware of what you find therein. Be aware of what your inner child wishes you to know now. Be aware, as strands of light from the Divine pour into this space and time bringing blessings to the essence of this divine child of God, through light, love, bliss, compassion, and understanding. Love is all around you. Well-being is all around you. Divine healing light is all around you. Breathe it in. And this light cycles through your body, refreshing each and every cell, pushing out at cellular level beliefs, emotions, and toxic energy held within your being. Release this now. Your energy may tense up for a moment before you release. Let it neutralize and go into the light, so that you are able to integrate the full, divine qualities of your higher self. The divine qualities of your inner child, bringing back your playful nature, your trust in the universe, your complete and total love, your divine imagination and well being, self love, and love for all. Know, beloved one, that you are at the brink of entering into a new layer of experience for yourself. This healing from your inner child brings the playful qualities, willingness, and imagination to your present self, to draw upon, to put yourself out there, to take a chance, to really go for it, to manifest the dreams, the desires, and the intentions of your heart into life. The time is now and you are ready. Open your heart to accept these gifts and blessings of your inner child. As the old and outdated fades away, do not mourn. Smile at what has been, for it is rather impossible to smile and to stay in a mode of negative manifestation. And so simply forcing a smile upon yourself can be enough to shift your thinking, to bring yourself back into the perspective of being aware of all the many blessings that are around you, including the many blessings that have yet to come about, and those that are beginning to fade away. Honor what has been, honor what is now, and trust that as something leaves your life, it does so to make room for something new to be birthed into your experience. What will be birthed is largely determined by you. There is a Divine plan for your life however, this plan is likened to the books where you choose your own adventure. For you see in every moment you have a choice to head towards love, or to move towards fear. You are choosing your own life adventure, painting your life, and creating your story in every moment. And so focus upon the love and the successes and the blessings, to draw more of them unto you. And when things turn challenging, know that sometimes it is OK to let them go. It is OK to let the outdated melt away. But as things leave your life, give thanks for what has been. As you embrace this attitude of love, as you view your reality through the lens of love, reality will shift, and it will change. Hardships may melt away and new life will be birthed. With awareness you can ensure blessings enter into your reality. With gratitude, love, and compassion, you hold the power to create positive change in your life, for Earth, and for all beings. Now is the time, you are the one, and this very moment is the moment. Indeed, I am Archangel Metatron and I greet you in this moment outside of time and space, to speak with you about the part of you outside of time and space. The spiritual, powerful, blissful, serene part of you directly connected to Divine Source and to All at every moment and in every time. The stream of your soul consciousness, the being of unconditional light and love, who is in this and every moment connected to Divine wisdom, truth, knowing, and certainty, who is fully and completely aware of your path laid out before you for this life. Aware of your objectives, lessons, purpose, and mission as a soul, and as a spiritual being in physical form. The spiritual being that you are, your higher self connected to higher consciousness, is connected to All That Is and guides you, assists you, watches over you, looks out for you, and acts as a guide for you in this life. Nudging you away from distractions and roadblocks and false truths, and helping you to keep on track in this game of life you are playing. Your winning ticket, your secret strategy that which will serve you most, is recognizing that the energy and strength and skill you need to progress lies not outside of you, but is accessed from within. Tune into the frequency, light, wisdom and truth that is yours. Tune into your Higher Self. Love holds great power, which we angels are aware of, and which your realm is beginning to become aware of also. Indeed, the power of love will help you to manifest and to create what you want. Love is the fuel for your ability to create in your reality. Understand that this love begins with you. If you are looking for love outside of yourself, look no further for even in the most romantic sense, love must first be found within. We angels send you frequency, and vibrations of love to cleanse and lift your energy now. Allow your heart to open wide, and allow the energy of Divine Love to swirl around, and to be completely present with you here and now. You are so loved, and as you love, you lift. And as you lift, more and more of your authentic truth, of your authentic power, of your divine birthright, of your highest path becomes known to you. Let love be your guide and you will be led well, for the power of love does not end with you. When you are loving, this love flows out, infuses the collective conscious, and what you send, you indeed begin to attract to you in return. As you love aspects of your life, as you love the people who you care about, as you love yourself, more and more love is drawn to you in the form of that which you desire to create. Love in the form of blessings, and in the form of angels who are always with you, awaiting your command, awaiting the opportunity to assist in helping you, open to more love and more light, to raise in vibration and truly be transformed into the angelic being that you are at your essence and at your core. Choose love. In your physical life and reality, you need not engage in energetic battles, in games of manipulation or in struggles with others in order to pull energy towards yourself. You do not need to look around the physical realm for more energy. All you need to do is enter within your heart, allow your heart to open, and let yourself lift into the Divine realms to make the connection. Feel your connection with Divine Source, and with the love, energy, healing, well-being, creativity, compassion, rejuvenation, and joy that is present here. Allow these magnificent qualities of the Divine to merge with your being. Know that you are one with the Divine and let yourself experience this now. Let the beauty, glory, and magnificence of this authentic connection with Divine Spirit overcome you now. Enjoy basking in the light of the Divine, and know that in every moment you are able to make this connection. When you are authentically connected with the Divine, Divine Love and light, well-being and ease are all available to you to call upon effortlessly. And so in this time of busy schedules and many draws upon your energy, know that you have an abundant supply of life force energy, of light, of Divine Love to give. Simply remember in the moment, to breathe, relax, imagine, and be aware of the Divine Light that is all around you, for it is interwoven into every moment, and into every particle of reality. Breathe, open your heart, and lift to link directly with the Divine for yourself, for your benefit, for your healing, for your well-being, and for the highest and greatest good of all. You have the ability to access new information at this time. It is by allowing yourself the freedom to explore the realm within, to explore your inner sacred space while remaining open to what you find, that you gifts can fully manifest. Your power is awakened and as you consciously walk the path of love. It is able to be accessed by you in every moment, with conscious choice, through awareness evaluating your mental patterns and constructs of thought, asking \"Is this moving me in the direction of increased love?\"
If not, release fear, for if you are not moving towards love, you are moving towards fear. Release the fear into the light and return to the heart centered place of awareness and of knowing that you are divine, that you are so loved, that you are connected directly to the divine, to the angelic realms, and to all that is. Feel this now, experience this now, see this now, witness this now and return to this realization often, as often as you can. For when you witness your divinity, you blossom in the power of love, awakening the full extent of your gift to access the new, to embrace the change, and to make a difference for the highest and greatest good. And so it is. I, Muriel, and your team of guides and angels flow a final surge of healing energy into your present space. Dance in the light that is all around you. Celebrate the magnificence of this energy, for you are not separate. You are it. You are magnificent, brilliant, divine. Live this truth, live, love, for this serves, for this is. In every moment, there is a personal atmosphere of energy around you. Your thoughts, emotions and your beliefs determine the reality you perceive and experience. You may ask for signs from the spiritual realm and yet, without attuning yourself to receive this vibrational energy signature of spirit, if you are still focused solely in the physical realm, much of the communication will be missed. You are accustomed to filtering out much of the spiritual realms and the personal atmospheres of others. You only perceive and experience those that are in vibrational resonance with your own. The personal atmosphere you vibrate with, indeed, has a direct impact on that which you will perceive, and on that which is drawn into your experience on a personal and collective scale. Your vibrational energy signature intermixes with the collective consciousness always. And so this is why you, the individual, hold the power, hold the key to transform and to realign humanity and earth with the spiritual truth, with the divine realms of cooperation, compassion, and co-creation centered in love, in peace, and in gratitude. And so to attune yourself to the spiritual vibrations of truth and healing, peace and love, we begin by inviting you to relax, and to let go of focus upon your physical senses, to enter into still, calm, focused awareness. Focused upon spiritual vibration, and upon infusing your personal atmosphere, your energetic signature with Divine. A foundation of self-love and nurturing will carry you forward into experiencing more love in many forms. Nurturing yourself indeed speaks of honoring your body as a temple of the Divine, treating your body with the utmost care and respect, and listening to the intuitive guidance of your heart and your soul, which will urge you forward in taking excellent care of your physical vessel. This is a foundational move for you to continue to lift higher in spirit. For when your physical body is healthy, you are then able to find nurturing for your emotional body needs. You will then find it is easier to heal your mental body and to enter into a meditative state, without having to work through so many toxins and densities in your physical form. Devotion for self, you see, is not selfish, and it is not vain. Love and compassion for self, makes it possible for you to love and be compassionate towards others. The love and nurturing and care you share with yourself is prerequisite for being able to overflow blessings of love, of abundance, of compassion, of all things good unto others in your life, into the collective consciousness, unto all. With immense self-love and care, you will have the energy needed to manifest and create your goals dreams. You will have the peace and the balance required to retain a perspective of compassion towards others in all situations. And indeed, your love for self builds and grows so that you are able to overflow, and the love you give and share, activates, uplifts you in vibration, and attunes you to more of your personal power in spirit. More of your spiritual light, your gifts, more Divine Love, which holds the key to transforming your life in all areas. Nurturing yourself creates improvement in all aspects of life, for yourself and for others. Your heart is the sacred portal allowing you to access the higher realms. Allowing you in this moment, and in any moment, to tune in to Divine Love, light, and All That Is. And so take a deep breath and drop into your open heart. As you do, it is as if you are being surrounded by a hug of peace, and a hug of calm, quiet stillness. Enter into this, for this place serves. This energy in and of itself will heal and will realign you with your purpose. This is the space by which you are able to receive direct guidance from the Divine. This is where the full power of Love becomes available to you. It is always here, in every moment, and so quiet your mind, open your heart, and enter in. Is it stillness, peace, and calm that you find therein? Or is there some lingering doubt, pain, fear or ego thought that comes up for you now? By quieting your mind, imagining that light and angels are all around you (for we are), and opening the doors of your heart wide, you\'re able to let the light shine in. Let this light lift and release that which has served its course. Any pain, trauma, suffering, tension, jealousy, rage... Let it go. Release into the light. Let all that limits your heart chakra from fully opening be returned to the Creator\'s light. Now lifted on wings of love into the light, once again visualize consciously opening the doors of your heart. Open and enter into this sacred portal of love. Love is here, love is All. You are One with everything. Remember this, and know that opening your heart activates your authentic self, the you that is physical but is also connected to and remembers your connection to All That Is. New levels of light are available now. You are ascending, you are raising in vibration as an individual, and as a collective consciousness, as Earth, as One... And so as you reach new heights, new heights become available to be reached. Visualize this now, Divine light from below you shining up. Divine light from above you shining down. Divine light from within you shining out, so that you are luminescent, you are likened to an orb of divine frequency and energy vibrating to the beat and rhythm of unconditional love. Honor the challenges and struggles which have been, and how far you have come. Imagine that you have passed through a doorway of light, and you are on the other side, the worst is behind you, and the best is yet to be. You are facing the light. You are light and love, and vibrating as this draws more of the blessings of these higher vibrational frequencies into your life. The energy of the light aligns you with your highest potentials, inspires you to set empowering intentions, to manifest your dreams, to create positive change, to live in love vibrating with new levels of unconditional love, for all of life, for All That Is. Higher vibrational levels of love are aligning with you now, and as you lift higher and higher, higher frequencies are available to enter into your being, to uplift you further, raising into the light, radiating unconditional love and well being. Turn away from what has been, turn away from fears and doubts, and turn towards the infinite opportunity and possibility before you. Turn towards potential miracles, blessings, joyful events, momentous occasions, and turn towards the love and light available here and now. Give love, receive love, shine light, and be illuminated. Let the light reveal your highest and best qualities, attributes, and gifts, the ways you may serve yourself and others... The ways you may live, joyful and inspired. You have reached a powerful point of new beginning which through your thought, your vibrational energy signature, and through your intention, enables you to consciously co-create with Divine Love to bring a new level of joy, vibrant well-being, health, abundance, and love into your life. Know that love and joy are the most powerful vibrations in the universe and simply calling these vibrations in, surrounding your energy with love and joy, will not only uplift you and bring new positive experience into your life, but love and joy will actually protect your energy, your mind, body, and spirit from absorbing unwanted, unwarranted negativity, doubt, fear, and lower dense vibrations from others, and from your world. The amazing thing about joy and love is there is no limit to the power. There is no limit to joy and love. And so now as dense energy is released, this orb of joy and love around you becomes strengthened even more. We flow more and more joy, love, light, and high vibrations from the angelic realm your way to cleanse and lift you. Imagine that as you breathe in, joy, love, and light fill your body. And as you breathe out, this same joy, love, and light fills out your aura. Nurture love and joy, and love and joy will nurture you. These forces of the universe will propel you forward to accomplish your purpose. Joy and love are a guide. Pay attention to what brings you joy and keep moving in this direction. Want to have these angel cards with you everywhere you go? Download the app free for your phone or tablet! Or order the Ask Angels Oracle Cards in Print on Amazon! The best way to start off an angel card reading is by calling in your angels. To do this, take a moment to simply focus your awareness within. “I now invite my angels of healing, love and light to please enter into this time and space. Think of a question you have for the angels and focus on it. Your angels can hear your thoughts so you don’t need to speak your question out loud, though you can if you want to. Rather than asking yes/ no questions, ask for guidance, insight and information from your angels. Focus loosely on the question you have for your angels as you now shuffle your cards in the way that is most comfortable for you. 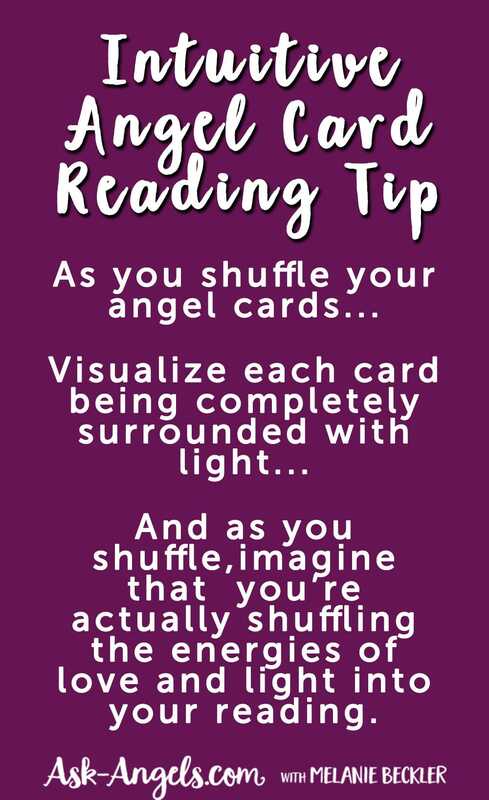 Imagine that you're actually shuffling light into your angel card reading. Trust that your angels will guide you to choose the right card and will connect with you through this angel card reading. Choose a card. Whichever card you choose is perfect as there is no wrong way to choose. The angels will guide you to select the right card, so don't worry too much about how to select your cards. You can look for cards which seem to stick out a bit as you shuffle, or you can randomly choose a card. Once you choose an angel card, look at it! Notice the card image and title, and pay attention to any immediate insight as to its deeper meaning in relation to your question. Clear your mind, focus within and open your heart to tune into the love, presence and direct guidance of your angels available for you now. Next, read the expanded card description in the corresponding guidebook for clarity. However, be sure to honor your own intuition as to the exact interpretation in response to your question, as you will often receive additional insight directly from your angels. Use your intuition to tune into real messages from your angels, without needing your guidebook at all! Experience your angels in a fun and powerful way through Angel Card Readings with the print version of the Ask Angels Oracle Cards! 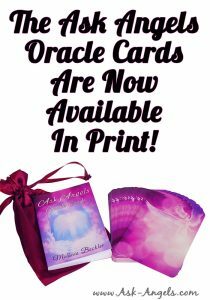 When you order the Ask Angels Oracle in Print, you will receive 44 beautiful oracle cards, a satin pouch, and a comprehensive guidebook. Each of the messages in the Ask Angels Oracle cards are channeled by Melanie Beckler and carry the love and frequency of the Angelic Realms. Raise your vibration, receive angel messages, and bring greater joy and love into your life! For many, Angel Cards are a great way to begin to tune into the power of divination and to start receiving direct, timely insight from your angels. Whether you are new to working with your angels and angel messages or if you are a seasoned card reader, there is great benefit working with angel cards. Click here to order the Ask Angels Oracle Cards in Print! Angel Readings are a fun and positive way to connect with the guidance, love, and support of your angels. If you would like a one-on-one reading, now Click Here and remember as a new customer with our recommended partner, you can save 50% (up to $50) on your first reading…. Want to see me do an angel card reading with the Ask Angels Oracle Cards? Check out this video below. You can also try the New Daily Angelic Inspiration Oracle Card reading Here! Ready to Learn More About How to Give Accurate Angel Readings? Click here to access The Ultimate Guide to Angel Readings… This comprehensive online guide is now available to you, and it's completely free! Want A Private Angel Reading? 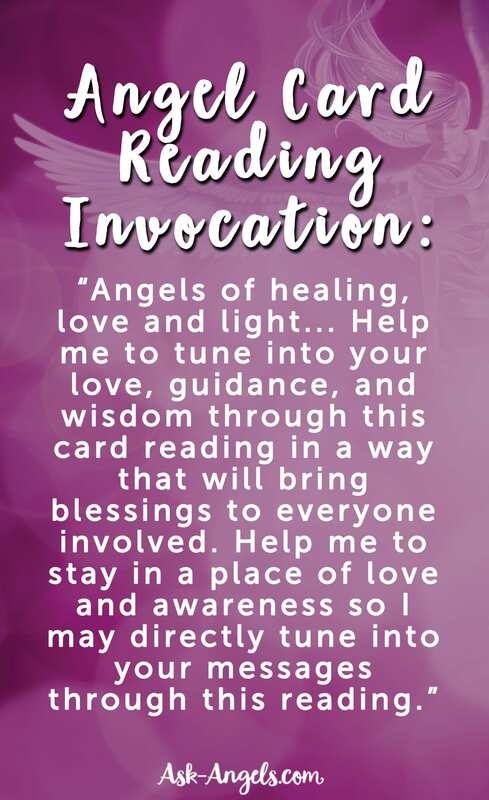 Learn about our private angel reading options via phone or email by clicking here! The Ask Angels Free Angel Card Reading was created by Melanie Beckler. Individual card artwork for the Ask Angels Oracle App is from www.Shutterstock.com, mobile App design and development by Indie Goes Software. The WordPress Angel Card Reading widget on this page was created by SwellPress and licensing of this technology is available. You can email support (at) swellpress.com for information and details. You must have a WordPress site in order to create a card reading widget similar to this one with their technology. This app is designed to help you quickly get all of the benefits of a print angel card deck online whether you are on your laptop, tablet or smartphone. You have help, guidance and assistance with you, always. Sometimes it can be difficult to tune into this guidance and these cards are a perfect way to bridge the gap between what is going on in your life and angelic guidance and assistance. Just ask your angels for a message that you need now, or for help with a situation and pull a card… You will be directed to a message that will serve you on your path at this very moment. Many hours have gone into custom developing this card reading widget here on our site and I truly hope you enjoy! how can you keep the faith and continue to hope and pray when everything keep going wrong. you pray and get nothing. On Dec 28th a gold angel coin dropped right out of the ceiling onto my feet! I have never seen such a shiny gold coin like that anywhere before. I told my friend today about this astonishing event, and she was shocked because an angel coin flew out of her laundry basket last Monday (10 days after my event)! Have you ever heard of this happening to anyone before? We are wondering if this has happened lately to any others??? I saw a sign in the sky that I was wondering if anyone knows what it means. I saw a huge bright star that moved from the west to the east. I could see this star in the full light of the morning. During the day I say a white man on a white horse, an angel with a trumpet and a scroll, a key ring with 4 keys on it in the shapes of the clouds. That evening I say this star in the sky right above me with every other star lined up in a grid around it. The next day I then saw the king with a scythe stuck in the ground and an angel fly through the sky with a scythe in its hand in the shape of the clouds. Is God trying to tell me something? This happened around March I would say. Please I want to be a member of this Angelic card reader . I want to be involved in your teachings , .I want to be having Dailey Angelic card reading about my daily life. Thanks for the free card reading, the card I chose has the one thing that has been heightened recently – my kind of 6th sense – I may possess psychic abilities, I do feel energies around me and in my objects at home (all my mechanical clocks – yes I do collect them as a passion – have individual energies), and I certainly can sense angelic forces in my aura. I have noticed a lot of things that logic cannot explain over the past few weeks. It’s great to know that angels are guiding me in life now. Yes! Both the Ask Angels Oracle Cards and the Ascension Angel Cards are now available in Print! THANK VERY MUCH FOR YOUR FREE READINGS!SO HELPFUL!BE BLESSED ALWAYS! Ariel is a lesser angel in the Choir of Raphael and she, along with her brothers and sisters, provides inspiration and illumination and work with the Choir (Holy Serpahim, not the Firery Seraphim of Khamael’s choir) of Immanuel (also called Metatron) to cause the feeling of being (lifted like the invisible, white light rays of the Sun). But when they hand you over, do not worry about how to respond or what to say. In that hour the Holy Spirit (Immanuel (knowing), Ratziel (wisdom), and Zaphkiel (understanding), will teach you what you must say. Petition the Source, and He will dispatch what you need. Uriel is the butterfly on your card! Petition YHVH, and He will send you what/who you need! Pray to angels, and you will get ignored! I am fully grounded just two days ago aftertwo days ago by a negative person. Why am I spacey after this grounding meditation? It took hours to regain groundedness after a lot of gas was passed out. Sounds like there was a lot of clearing you experienced in addition to grounding. Sometimes a higher level of light is what’s needed to counteract negativity… Getting adjusted to higher vibrations can cause a bit of spaceyness at first. Thank you for this Melanie for I truly enjoyed reading it and hope one day I. Ll be able to go furthey with it .I haven’t been working seens the end of June and it’s not looking good for a while but when it does I will buy the cards and try it but I would like to thank you for everything you have done for me . Your Angels Card Reading is lovely and refreshing. Very inspirational too. Thanks and keep it up. So glad you’re here! And happy to hear the message you received was helpful for you! Thank you for the Angel car reading. Angels and Arcangeles are always close to me protecting and guiding me, you are as close to me as they are. Thank you for all that I have learned from you. You are a blessing in this life . Always a source of inspiration , love & guide to experience infinite within our finite.. Thank you, lovely cards and words. Very supportive! Did you ever figure out what the 3’s meant? I personally believe that your angels or the universe or perhaps a deceased love one is desperately trying to get your attention – in a good way. That’s pretty exciting either way. Hi Melanie, I receive your posts regularly.I have downloaded some of the mp3 meditation from your site for angelic guidance. I don’t know why I am unable to connect with them. I am 46yrs of age and all these years it has been negative events happening one by one. I believe that I am not meant to be a loser or failure in life always but consider what has happened as past which shudnt recur again..I crave to live a normal life like everyone else with happiness and family around. My date of birth is 29 December 1969. Does it signify anything. Is something wrong with my birthdate. Don’t know the time of birth as both parents have passed away. Currently in relationship with a man for almost 2years who is seperated from wife for 3years had agreed for divorce but when it reached her she refused to give divorce nor wants a family life with him.he has 2daughters so not doing anything further by filing counter case as kids shouldn’t be mentally affected as his wife nags and shouts at kids and him often.as per the UK law he will have to forfeit a lot of things if he still file for divorce again. We both want and need each other and waiting for divine help and that’s how I found your site. I desperately need help Melanie from you with guidance and also from the divine angels. I want to know and feel their tangible presence. Is that possible. I want the obstacles removed that’s hindering my life and happiness with my guy Abraham.I really need help. Thank you for the Angel car reading, I used to meditate often and at that time I saw hundreds of sparkly lights around people and in my home, since I stopped I only see these sparkles occasionally , what are they? what do they mean? Thank you for angel card reading , u always encourage me Melanie, always send me such messages. Thanks a lot Melanie for your free 5minmeditation & Raphael healing connectivity. I started to experience those last night and be surprised by my sleeping time to be like a baby; from9pmto5am that I never get like this more from November last year. I’ll continue to use those time after time & shall share you what’s happened when I can. many Thanks to you! Messages can be transfered from you to another person through many many ways, but no matter what way angels will choose, the person usually knows from whom message originated. Angels can use most personal motives, known only to you two. When I was in role of a receiver, messages appeared through very clear dreams or (when awake) through certain thought or strong feeling. They can also be in form of a picture or situation… Sometimes I appeared to be a messenger between 2 persons. In such cases the need for action was so strong that I simply must leave everything and go to contact a person who was a final receiver. Everything appears so naturally and in quite clean form that I never had doubts in what happened. Enjoyed the Angel card. It was reassuring and confirming. Thanks, Melanie. Hi beautiful one..This card really helped me today! I was asking spirit for awhile to please tell me my guardians name. And a name just popped into my head..So I thank you spirit for letting me know & thank you Melanie 4 all that you do 4 us! Thank you for my Angel reading its nice to get great readings full of positivity love and hope and be left with the wonderful feelings of enlightenment to move forward with positive feelings. i do believe that there are angels because always they allow that i can feel them in the form of signs that i encounter along my way. im so happy because it uplifts my emotional being and my spiritual too. thank you Angels and to this website. more power! Thank you, Thank you and Thank you, a heartiest gratitude to you for helping so much again once THANK YOU VERY MUCH!!!!!!!! Great! Thank you, and I will be visiting and enjoying my readings daily. I’m trying to figure out what I am supposed to be doing in life as I was born on 1/11 at 11:58 pm just 2 minutes from being born on 1/12. I am a spiritual person and would love to communicate with spirits who have crossed over if I could. I am at church every sunday and do pray for everyone. I do like to go have fun on the weekends and do play the lotto I am not greedy and others would say I have a heart of gold. i’ll be 36 in just a few days and just wondering what God and His angels are trying to tell me. This message from my card is true. I feel no hate for other’s if they do me wrong. I have been playing games all my younger life and adult nearly my hole life and my anger was if it was redirected not at any person but to release all of that on something that would not fight back in some way. I feel now forgiveness of anything people have done to me sometimes I say to myself there’s really really no need to get so frustrated over something that’s so little in my life. it’s like those days of gaming was a pathway for myself to have a better life and to be more alert or wiser to the real thing’s in life that really does matter like people. my heart is feeling when I am speaking to someone if they have a problem with what I am doing or that they just see the point or it’s a person that talks to you in a not so nice way. the first words I feel is. there is light hidden from there eyes they cannot see a better world. maybe it’s something that’s happened to them. anyway I am looking for a job to get and the information in this card I got was saying your path is looking for some type of Job were you and your workplace can get along. but also it’s trying to say what ever job you do get you will be loving or kinder to people witch they will admire me or that they see something within me that I cannot explain. this is what my card says I copy pasted it below this writing I did. Your Website is Sincerely Special/Inspirational. I Sincerely have come to know More about the Archangels and how Faithful they are to Mankind. And All we have to do is Ask. Bless You Melaine for Giving such Purity, may you be Blessed 10 Fold. Thank you for the free daily readings. I look forward to what card I pick and have enjoyed your audio meditations in calling in the angels. Gabriel has come to me today and it sits incredibly true in my total being. I trust and hold joy even though my current situation requires that I move on from my marital relationship of 28 years. Yesterday I had a meditation with Metatron, and a “blue alien being” came to me and entered into me, for healing, protection and guidance. It was an incredible experience which reminded me of our new earth vibration and ascension. Blessings to you Melanie. Hello Melanie. Thank you for your blessings. Since being on your site through fb, I have visited the free angel card pic almost daily. There are huge dynamics going on in my life that keep turning towards me even though those who are directing this bad energy and stress are my husband and my adult children. I am currently taking a treatment for a disease I have and am struck with a daily headache and feeling blue. I work as a psychiatric nurse in a very complex floor with many very sick individuals. My attitude is comical and friendly while at work, to help them lighten their stressers. I am well liked by staff and patients alike. I have been hiding the fact that I may need to end my 28 year marriage to my husband. He is an addict and immature. I cannot stand living with him any more. Oh and he is usually unemployed. Please help me with what to do. I feel overwhelmed and have been calling on God and angels for help. I was currently drawn to your website through multiple things currently that are happening in my life and the amount of confusion and stressing is overbearing most of my days. I find it difficult to wake up in my moments. My panic attacks and stress tend to stray me from allowing to be in a calming state and really listen to any messages that I feel I am trying to attract. I for some reason was stuck on the Date December 15, 2014 and was wanting to know if this is a significant date for some reason for me? I am also just aching to know if in the next month or so am I able to see if he will return back to me in a better and healthier state or am I holding on to something that is not there. Really trying hard to get ahead financially, seems like I am always scraping to get bills paid. Is it going to get better anytime soon. I was adopted and it was a very unhappy home. Alot of emotional,mental pain and destroy all of my self esteem and safe worth. I left one part of hell to another part when I got married. I didn’t know at the time what he was. He was and is Habitual, compulsive and a pathological lair and a compulsive cheater. I am unable to get out of this marriage because of financial reasons but I am working on it. There is no love left in this marriage on part and after we were married is when I found out he was never in love with me. I was just ” a good girl” all of his other girlfriends was into drugs and trouble with the law. Please tell me I will be able to get out soon and make it on my own financial.. Since 2011, when I went through the worst period of my life. A facebook friend brought me to the world of Angels. I have always been a person who believes, but I had lost all my faith 2011/2012. Now I have become a true believer in Angels and Higher Powers, I have a collection of crystal angels. I also have ‘We are Human Angels’ , Angel cards although I must still learn to read them, and today I received the bottle of healing oil and have added some to a diffusser that is in my sitting room. In my prayers every night, I always ask Archangel Raphael to keep me wrapped in his wings and help me get over this illness. Strangely enough, tonight I drew Archangel Raphels card with the message that he has been with me all day. Please help me with my quest to learn all I can. You bring me such comfort. Alice (Known as Beth) Palmerton. I have had so much pain over the years and it still is going on! I live so alone and see no one unless I go to town or out on weekends! I wonder if my life will change and if I will ever have enough to live on? also if pain will stop? Thank you so much for your site and help! Im a 38 year old single mom. i have hurts from the past lingering and with Angelic help i am doing my best to get rid of what does not serve me. I am stuck however and need direction. I have met someone but need a great deal of clarity on the matter. I am scared. Can you provide insight please? I’m in a relationship with a guy who lives in another continent. we have been in touch for one year 7 months. I feel this is an emotional affair. But with all the FB guys they say its a twin flame relationship or a soul mate relationship. He is a married guy and I’m a widow. He is very much into this relationship as I am. When we got in touch and things were not serious I did tell him that he should not allow his married life to get affected with our friendship. But for the last 3 months I feel differently. I feel I am wrong feeling this way as it will split him from his family and as if I ask for him to leave he may not and if he does I will not be happy with him. A relationship with someone that I love so much has ended, I wanted to know if that person will come back into my life in the future? Ive moved to a new country on my own.And finding it hard to find work. I’ve worked in office jobs for the past 6 years.Im passionate about the fashion industry which is what bought me to this new country.Whilst I’m struggling financially, had many interviews and some what desperate to find work.opted to going back to working in the office. I prayed this morning to ask the lord to assist me in a career that’s fulfilling my divine life purpose.And I drew the authentic purpose card.The message popped out immediately,where I should be focussing my energy on. Your channeled angel messages have helped me through the sad time of the loss of my life partner Dennis 15 month ago. I trust in the Divine Messages of the angels and recently noticed something amazing. I feel a great sense of beautiful energy around my crown chakra and often see the most beautiful shades of violet and purple. There is also very often the feeling of being touched, it feels like I am connected at all times. Thank you for the great work you do. Thank you! I see others have shared numbers they see, for me it is 11 and then numbers that can be divided by 11, such as, 22, 44, 55. My birthdate adds to 11, time I was born adds to 11, house number adds to 11. License plate adds to 22. When glancing at the clock there is always 11. Receipts add up to 11 or 11 in change. Thanks for all you do! I keep seeing the numbers 9 and 7 for almost a year now, what do they mean. I’m just starting this. I’ve always felt this way and just stumbled upon your site. I’m glad I did. I just have one question to see if it means anything to you until I get on my computer and get into things more.my birthday is 5-6-78 does that mean anything. I’m just curious cuz it feels like I was born on that day for a reason. Thank you in advance I look forward to researching myself through the site. Hey Brandy, there is totally meaning to this! 5678 resonates with spiritual freedom, and positive life choices. Thank you ! But do you know what the numbers 3553 mean ? 3553~ Your angels and the ascended masters have heard your call and prayers to experience positive changes in your life. Many changes are stirring beneath the surface now in response to your request. Know that you are protected and supported in taking steps yourself to bring this positive change into your life as well… Start taking small steps which will add up to big change, and remember to ask for help along this path as you have a HUGE amount of support from Heaven. Thank you for this card reading….it*s realy halping me!!!! THANK YOU!!! Thanks Melanie , for letting us into your site. Thank you so much for the free reading. It was an eye opener for me. Would love to buy an Angel deck. This is the second time I have asked for a reading. Have not even received an acknowledgment. Thanks for commenting, and I do apologize your request for a free reading has not been acknowledged. Know that we get a ton of requests for free readings and are only able to offer so many for free each week through our weekly Ask the Angels Column. If you would like to ensure your questions are answered I would recommend purchasing a reading here. Hello melaine, thank you very much for your angel reading ! I really enjoyed reading it ! And I am happy to know I have an angel with me ! Many many thanks again. do you have angel reading app for iphone it says on your site you do but i cannot see it. Thank you! These cards are always very uplifting, encouraging and great guidance to me!! love and gratitude!!! This is so accurate. I am in the process of cleaning off the old guttering stuff that had been blocking things in front of me. Thanks so much. Thank you for the reading. It was very much right on and I needed it to bring myself around from feeling as if I am scattered everywhere. I have five archangels visiting me at the moment and Raphael is one of them. It is wonderful to find this site and the Raphael angel card prayer is so inspiring and wonderful. Thank you. This site is helping so many people. The guidance you share helps me stay on purpose. Mel, thanks you for access o this awesoem website. Is there is a link available to down load the new moon acticvation with AA Raphaeel? Thank you for your site. I would like to order the angel cards once they are available, and since I signed up for the newsletter, I’m sure I’ll be notified. I love the dreamy type feel, and colors you use. Not that it’s a bid deal, but I would prefer the printed version to not contain the website on the back of each card, perhaps on one extra card would be better. I wanted to make you aware that the link to view your angel card decks is broken. I’ve learned a lot from you, and I was looking forward to seeing your collection. Click Here to view some angel card decks that I personally enjoy and use. I absolutely love the way you incorporate angels and medications and the crystals that correspond to the message. Thank you for creating this website and allowing yourself to be inspired!